Bringing a glorious glow that we are all in need of from time to time, this Rose Gold Sun Necklace is an instant uplift to your look. With one foot firmly in the super cool seventies, this bohemian sunburst necklace also reminds us of the deco period so you are getting two awesome eras in one beautiful piece of vintage style jewellery. Rose gold continues to be a blogger's best friend, so this beatnik star shaped necklace is all you need to stay on trend too. A firm holiday favourite, we reckon this pretty pendant will go with anything from a boho maxi to a formal flapper with ease. 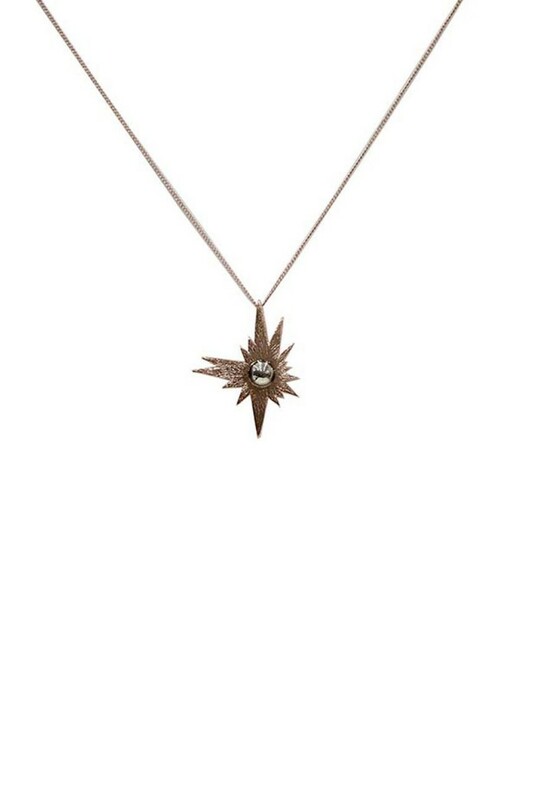 This is a rose gold tone metal a-symmetric shaped sun or star inspired pendant with dome centre piece held on a rose gold tight link chain.